Chelsea have reportedly tried to get Gonzalo Higuain’s transfer done as soon as possible in the hope of being able to play him against Tottenham. The Blues take on Spurs in the Carabao Cup semi-final second leg tomorrow evening, and are trailing 1-0 from their first game. Given the club’s poor form of late, Chelsea face an uphill struggle to get past Mauricio Pochettino’s men and into the League Cup final, and the arrival of Higuain could make all the difference. 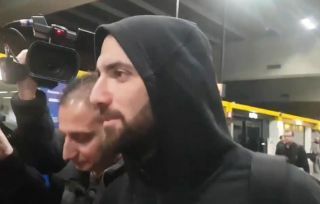 The Argentina international has already been pictured heading to London from Milan, and Matt Law claims CFC have got him on the earliest possible flight in order to register him on time, and hopefully include him in a training session later today. Chelsea urgently need an upgrade on Alvaro Morata and Olivier Giroud, with neither trusted by manager Maurizio Sarri recently as Eden Hazard has often been forced to move from out wide into a false nine role – an experiment that hasn’t really worked.